Who attended Lena Tindall’s Christening? One, two, thee, aww! Let’s find some pictures now! EXCLUSIVE: Prince Harry has been made a godfather to cousin Zara Tindall's daughter Lena. 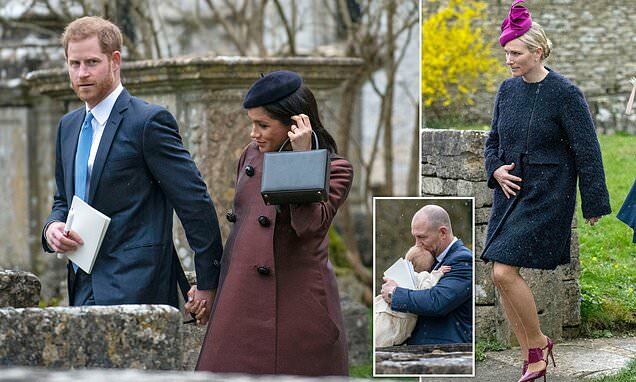 Meghan accompanied Harry at the low-key ceremony St Nicholas Church in Gloucestershire. For goodness sake 😖🙄 let me see if I can get them, no I can’t, copyrights. I’m wondering is Zara pregnant again? She is holding her tummy. The Princess Royal and HM look fantastic! I love Zara’s shoes, you have to click on the DM article.